Eleanor Ruth (Bedell) Hopkins age 98, of Holland, passed away peacefully Saturday, January 20, 2018 at Appledorn of Holland with family at her side. She was preceded in death by her parents Ernest and Rebecca Bedell; her husband of 73 years, Clarence (Hoppy) Hopkins, sister and brother-in-law, Shirley & Robert Becksfort of Niles, MI. She is survived by her sons, Kurt (Sharon) of Jenison, Mark (Linda) of Wyoming; grandsons, Ben (Jen), Chad (Jamee), Kevin (Rachel), Brent, Brandon (Michele), Miles & Marc; two great-grandsons, four great-granddaughters; nieces Sue (Doug) Stone, Sara (Scott) VanDerbeck; great-nieces Amy (Tom) Roose and family, Kate (Ryan) Clark and family. She graduated from cosmetology school and worked as a hairdresser for many years. She was president of the Holland American Legion Women’s Auxiliary, later becoming President of the American Legion 5th District Women’s Auxiliary. 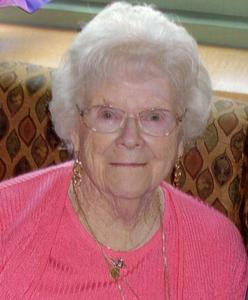 She was a longtime member of Hope Church and was very active in the Women’s Circle. Visitation will take place Saturday, February 3 from 10-noon with memorial service and luncheon following at Hope Church; 77 west 11th Street, Holland. In lieu of flowers, donations may be made to Hope Church.